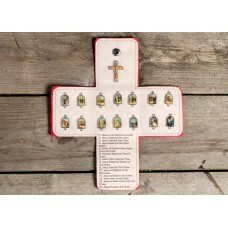 Each pocket oratory has been designed to be both beautiful and practical. Those little gems are made to be carried discretely around, in your pocket, backpack or hand bag, so you can pray when ever and where ever you want. 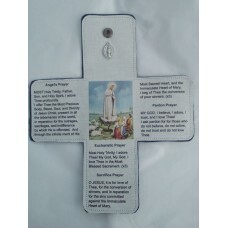 It is fantastic for travellers of any kind; business, holiday, army or other and will also make a valuable present for Holy Communions and Confirmations. Also makes the perfect gift for priests, seminarians, students, Godparents, Godchildren, family or friends; Christmas, Easter, birthdays, graduations, weddings or any other occasion. 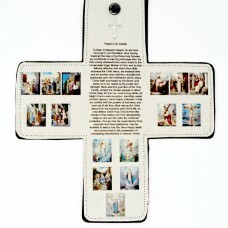 The outside of the Pocket Oratory is made of real leather and the inside fabric is 100% cotton. The crucifix may be different to the pictured one depending on availability. Once closed, the Oratory measures 9 cm x 6.5 cm (3" x 2.5") aprox. and is 1.6cm ( 3/4") in depth. It really is portable! Stations of the Cross OratoryThe Stations of the Cross Pocket Oratory is perfect for the time of Len..
Rosary Oratory - This oratory has got a beautiful icon of Our Lady in the centre of it, a crucifix a..
St Christopher Oratory With an icon of St. Christopher and of a Guardian Angel printed on the centra..
Sacred Heart of Jesus Oratory- Consecration of the Human Race to the Sacred Heart of Jesus Oratory. ..
Our Lady of Guadalupe OratoryYou will find the Icon in the middle of the oratory, the crucifix on th..
Sacred Hearts OratoryOratory with Icon the the Sacred Hearts of Jesus and Mary on opposite sides of ..
Holy Eucharist OratoryThere is an image in the middle with prayer by St Ignatius of Loyola on the le..
Act of Consecration to the Immaculate Heart of Mary OratoryYou will find the icon of Our Lady with b..
On the centre of the oratory there is a prayer to St Joseph which is surrounded by the joyful myster..
St Joseph’s OratoryThis oratory has an icon in the middle part, a crucifix sewn on the top, a novena..
Our Lady of Fatima OratoryOn this oratory you will find some of the prayers taught by the Angel to t.. Guardian Angel OratoryThe Guardian Angel’s icon is in the middle, with three different prayers on th..